"Your puny religion [insert Warden's religion here] is a joke. (((Judaism))) is almost done for, Christianity has become too backward and evasive, and Islam is a religion of not peace, but of terrorism. All other religions are irrelevant... except the Church of Hasselhoff. Join us, and receive the mighty blessing of the Hoff, or else." 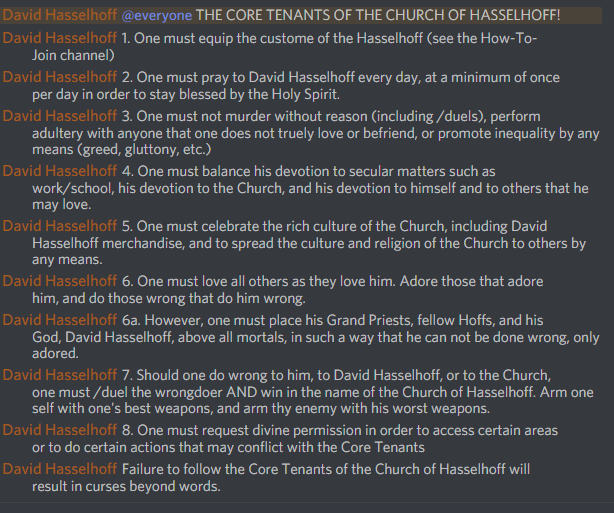 If he denies, get all the Church of Hasselhoff members to mob up on the warden and beat/stab him to death. This post was last modified: 01-13-2018, 11:38 AM by The Hoff. (01-13-2018, 11:09 AM)The Hoff Wrote: "Your puny religion [insert Warden's religion here] is a joke. (((Judaism))) is almost done for, Christianity has become too backward and evasive, and Islam is a religion of not peace, but of terrorism. All other religions are irrelevant... except the Church of Hasselhoff. Join us, and receive the mighty blessing of the Hoff, or else." This post was last modified: 01-13-2018, 04:29 PM by The Genghis Khan. This post was last modified: 01-13-2018, 05:01 PM by The Hoff.